Mason jars – Aside from being ideal for preserves, mason jars are a great way to display a bunch of different sweets. A cost effective option that is suitable for any style of space, you can usually buy mason jars in bulk and in a variety of different sizes ideal for holding gumballs, Skittles, Twizzlers, and even cotton candy. Stack them on shelves, arrange them around your candy counter, or even tie twine or a ribbon on individual jars to sell in store as a gift! Spray paint and saw several candlesticks to different lengths and glue them to the bottom of the jars to be used as pedestals to create a more unique candy display. Magazine racks and files - Things that are already optimized for organization and storage, like magazine racks and files, make great storage containers for bulk wrapped candy. Slim enough to be displayed in tighter spaces, magazine files can be displayed individually or side by side with different candy in each. Spray paint the surface and add a candy scoop into each magazine file. A hanging magazine rack is also a great way to save space on the floor and doubles as décor for your walls. Glass bottles – Instead of recycling all of those empty glass bottles lying around, upcycle them into a creative candy display! Clean out thoroughly, pour colorful candy inside (we love the way the colors of Skittles pop,) and top off with a crazy straw or cork to complete. 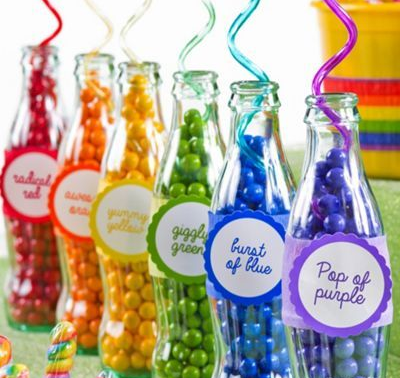 Pour a single color of candy into each bottle to create a rainbow display or choose to color coordinate for a particular display. Finish off with a ribbon or customized label to make a great gift customers can purchase or a party favor that is sure to be a hit among candy lovers. 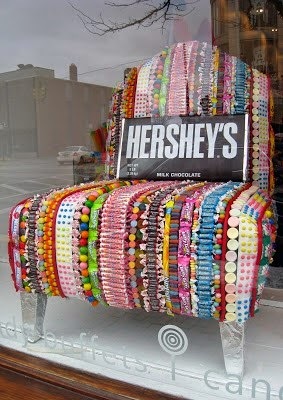 “Sweet Seat” –A large comfy chair is always inviting to passersby – even more so if it’s covered in candy! A great way to display a variety of your product, a candy coated chair can be placed within the store or displayed in the window of your store front to act as a draw for customers. Simply glue Sprees, gumballs, Laffy Taffy, Smarties and other favorites to the surface of the chair. Get creative and cover stools, tables, and even light fixtures completely in candy for a truly sweet aesthetic. Now that you’re sufficiently inspired, mix the above suggestions with your own creative ideas in crafting your very own mouthwatering display. Color coordinate, create tiered displays, and use upcycled old furniture for endless possibilities in creating a colorful and appealing candy buffet. And don’t forget about the candy that will make it all happen – be sure to check out our huge stock of bulk candy at The Wholesale Candy Shop!